Christopher Houston “Kit” Carson was a frontiersman, soldier, and one of the most dependable guides in the early West. He was admired for his self-restraint, temperate lifestyle, and unassuming manner. “Clean as a hound’s tooth,” according to one acquaintance, and a man whose “word was a sure as the sun comin’ up.” A legendary hero of the American frontier, he lived a life very much like that of his predecessor, Daniel Boone. As a matter of fact, the Boone and Carson families were good friends. Carson was born in Kentucky on Christmas Eve, 1809, the eleventh child in the family. His parents were the type to follow the frontier westward, and they moved to Missouri when Kit was one year old. The Carson family settled on a tract of land owned by the sons of Daniel Boone, who had purchased the land from the Spanish prior to the Louisiana Purchase. This is where Kit grew up and learned the ways of the wilderness. Carson never went to school, and it wasn’t until later in life when he learned to read and write while serving as an army officer. However, Kit was already an expert rifleman at age 8. He had to do his share of the farming and hunting to help provide food for the family, especially after his father died. At age14, Kit was apprenticed to a saddle- and harness-maker in the settlement of Franklin, Missouri, at the eastern end of the Santa Fe Trail. But feeling too confined in town, he ran away at age 16 and joined a wagon train heading to New Mexico. Once out West, Kit remained there for the rest of his life. At first he stayed with Matthew Kinkead, a retired trapper and explorer, in Taos, New Mexico. Taos was the capital of the fur trade in the Southwest. Kinkead had been a friend of Carson’s father in Missouri, and he taught Carson the skills he would need to be a trapper. Carson also began learning the necessary languages. Carson obviously had a gift for language because he eventually became fluent in Spanish, Navajo, Apache, Cheyenne, Arapaho, Paiute, Shoshone, and Ute, as well as the universal sign language used by the western tribes, and he even learned French from some French-Canadian trappers he met during this period. Over the next couple of years, Carson worked in and around Taos as a cook, errand boy, harness repairer, and wagon driver. Soon Carson was hired by a wealthy trader, who upon learning how well Carson understood the Spanish language, engaged him to be his interpreter. His duties took Carson to El Paso, Texas, and Chihuahua, Mexico. The position of an interpreter was a dignified one, but it was not exciting enough for Carson. The employment most suitable for Carson’s nature, he realized, was that of hunter and trapper, which resulted in his returning to Taos. In the Spring of 1829, Carson found the opportunity he had been seeking – his first official expedition as a trapper. He signed on with a trapping party of forty men led by Ewing Young. The men journeyed deep into unexplored Apache country along the Gila River, where the beavers were abundant but the group was attacked by Apache Indians. It was during this encounter that Carson shot and killed one of the natives, the first time circumstances required him to act in a way that resulted in another’s death. Carson was profoundly shaken by this experience. They continued across Arizona, went up the Colorado River, crossed the Mojave Desert and the Sierra Nevada, and headed north into California’s great Central Valley. Theirs was the first American trapping expedition to reach the Pacific Coast from New Mexico, despite a law which forbade the issuance of any license to American citizens to trap within Mexican territory. For the next ten years, Carson continued trapping beaver in the Rocky Mountain region. He trapped throughout what are now the states of Colorado, Utah, Wyoming, Idaho, and Montana. There was no trail Carson had not traveled, and no wilderness challenge he couldn’t beat. As was the case with many white trappers, Carson became somewhat integrated into the Indian world. In 1835 he married an Arapaho woman, “Waa-Nibe,” known in English as “Singing Grass,” who died of a fever after bearing him a child. When his daughter, Adaline, who he lovingly called “Prairie Flower,” reached 8 years of age, he took her to Missouri where she could be raised by his relatives and receive an education. On his way out of Missouri, Carson happened to meet Lt. John C. Frémont on a river steamboat in St. Louis. Frémont was in the midst of organizing an expedition to map and survey Western trails through the Rockies, and he was looking for a guide. Carson offered his services, explaining that he had much knowledge of the area and could speak to the Indian tribes in their own languages. In the summer of 1842, they set out with 25 other men on an overland route to the Pacific. Five months later they arrived in Oregon. The expedition was a success and Frémont praised Carson’s scouting abilities. Frémont’s published report was used as a travel guide by pioneers heading West on the Oregon Trail. The heyday of trapping was now over for two reasons: the new fashion of silk hats had replaced the demand for beaver fur; and the trapping industry had devastated the beaver population. Carson returned to Taos where he met and fell in love with Josefa Jaramillo, the daughter of a prominent family. After receiving religious instruction from a local Padre, Carson was baptized into the Catholic Church. At age 33, Carson married the teenage Josefa on February 6, 1843. Josefa’s family had opposed the marriage because of the age difference and the fact that Carson was an Anglo foreigner. However, the couple spent the rest of their lives together and had seven children of their own, plus they adopted an Indian boy who was going to be killed by his tribe for crying too much. Kit’s wedding present to his wife was a little adobe home in Taos which is now the Kit Carson House and Museum. Lt. Frémont hired Carson to be his guide on two more map-making expeditions, in 1843 and 1845. During the 1845 expedition, they were in California when a war started with Mexico. Carson was made a lieutenant on the spot, thus initiating his military career. He served with General Stephen Kearney, surviving defeat at San Pasqual. Kit Carson’s daring escape made him famous after he along with Edward Beale and an Indian friend slipped through enemy lines to get help for the American troops which were surrounded. They ran and walked for 25 miles without canteens or shoes, an amazing feat that made national news. After the Mexican-American War, Carson settled down to a life of ranching and farming with his wife and children. Meanwhile, Carson’s image as a fearless hero had been popularized, and in 1849, the first Carson action novel appeared. His legendary exploits became the subject of many best-selling western pulp fiction paperbacks in his lifetime. While it’s true that Carson was an experienced adventurer and explorer, contemporary accounts glorified and exaggerated his achievements even more. Being a modest man, Carson found this troublesome and would have preferred to do without the celebrity status. Nevertheless, there continued to be constant strife between the white settlers and the Indians. As more people moved west, they took over land on which the Indians formerly lived. The Indians raided and killed the settlers in retaliation and to steal provisions. For seven years, Carson struggled to mediate the mounting conflict between whites and native peoples, and to find some means of peaceful accommodation. He helped to make treaties to prevent wars between the Indians and the United States. Despite his skills in diplomacy, Carson seemed to be most at peace when he was out in the wild far away from the confines of civilization. When the American Civil War began in April 1861, Carson resigned his post as federal Indian agent and joined the New Mexico volunteer infantry for which he was commissioned Lieutenant-Colonel and then Colonel. Carson and his men took part in the Battle of Valverde on February 21, 1862, after which he was promoted to Brigadier-General for his gallantry and service. However, the New Mexico Volunteers were mostly occupied by Indian troubles because the tribes took advantage of the military slack caused by the War Between the States, to raid and make war on the New Mexicans. Carson and his soldiers ended up fighting the Apaches, Navajos, Utes, Kiowas and Comanches. 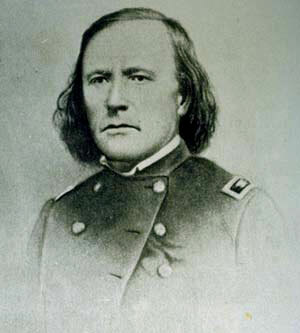 Brigadier General James H. Carleton who was the commander in New Mexico demanded that Carson alleviate the Indian situation. Carleton’s first orders to Carson were to kill every man in the Mescalero Apache tribe. Carson was appalled by this brutal attitude, and openly voicing his opposition to any exploitation of or violence against the Indians, he refused to do it. However, he did get more than a hundred Mescalero warriors seeking refuge to voluntarily surrender. When Carson learned that Carleton was planning on having him pursue the Navajo next, he submitted a letter of resignation dated February 3, 1863. Carleton would not accept it, however, and Carson was forced against his will to follow orders. Nevertheless, there were no pitched battles and only a few skirmishes in the Navajo campaign. After much soul searching, Carson instituted a scorched earth policy to burn their crops and homes, which coerced the Navajo to surrender. He knew that relocating to a reservation would be the only way for them to survive. Carson gave them food and guaranteed protection if they moved to Bosque Redondo. Though Carson is often associated with the Navajos’ 300-mile march to the reservation called “The Long Walk,” he did not accompany them on the trip. The Navajo may have thought that he had abandoned them, but since Carson was not there, the Navajo deaths along the way were the direct responsibility of the U.S. Army and General Carleton. Ironically, while Carson spent his whole life advocating for native peoples and would continue to do so until his death, his name would be forever linked to one of the most tragic episodes in American history - the “Long Walk” of the Navajo people. At the end of the Civil War, Carson was brevetted a General and put in charge of Fort Garland, Colorado. He died of an abdominal aortic aneurysm at Fort Lynn, Colorado, on May 23, 1868, just a month after his wife died upon giving birth to their last child. Carson’s last words were: “Adios Compadres” (“Goodbye friends”). The Kit Carson Chapel, located in Fort Lyon and open to the public, was constructed from the stones of the surgeons’ quarters where he died. Shortly thereafter, on June 18, 1868, the Navajo people were allowed to return to their homeland. Kit Carson lived at a remarkable time in American history, and he holds a unique place in the story of our country. Carson was torn between two worlds: the vast wilderness frontier, and the Westward expansion of the American territory. As such, he was a living symbol of that transition from the taming of the Wild West to the building of a civilized nation. Did You Know...? In Nevada, Carson City and the Carson River Valley where the city was founded in 1858 were both named after Kit Carson. A year later, Carson City became famous when a rich lode of silver was discovered there. The city would eventually become the state capital of Nevada. On the eastern plains of Colorado, the town of Kit Carson was established along one of the old emigrant trails that was later followed by construction of a railroad line. It was a thriving farming and ranching area until the disasters of the Great Depression and the Dust Bowl took out most of the population. Many other places were also named after Carson, and a U.S. Marine unit during the Vietnam War was named the Kit Carson Scouts. Free Download! The Life of Kit Carson - Download this 132-page reprint of an 1899 book, with added illustrations. Use caution if reading aloud to younger children; I would rate this story PG for scenes of drinking and Indian violence such as scalping. P.S. It is definitely NOT politically correct either! David Fridtjof Halaas, “Kit Carson, Likely Hero,” Colorado History NOW, May 1999, Colorado Historical Society.